SKU: 4. 類別： Aesthetix[雅士]音響, 土星系列. 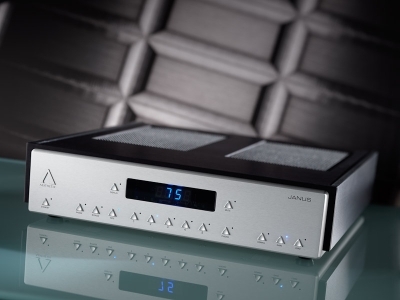 Janus is a full-function all-tube preamplifier with six line level inputs and one phono input. It is in the Saturn Series (link to Saturn Series description), sharing common design characteristics with the Rhea, Calypso and Atlas. It has won numerous awards worldwide, receiving acclaim for its sound quality, build quality and ease of use. • Fully balanced differential line-level circuitry with ability to internally balance a single ended input signal. 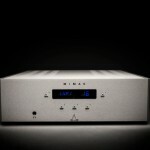 • RCA and XLR provided for each input. 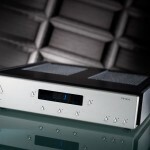 • Discrete resistor volume control with 88 1dB steps. 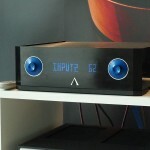 • Phono input: 40-75dB gain maximum, selectable via front panel or remote control. • Built-in MC cartridge demagnetizer. • 9 MC loading settings: 75-47,000 ohms, selectable via front panel or remote control. • All tube amplification and output (12 tubes total). 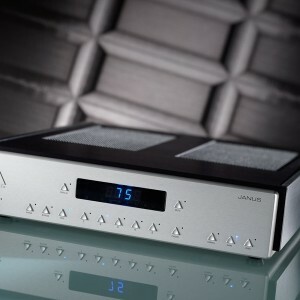 Janus is available in two versions: Standard and Signature. The standard version uses high-grade Rel-Cap polypropylene coupling capacitors. The Signature version uses exotic and expensive coupling capacitors and other critical parts to bring the performance to a higher level. All versions of Janus can be factory upgraded to Signature. The Signature version uses custom-made inter-stage Teflon hybrid coupling capacitors, replacing the polypropylene units, between the gain stage and output stage (2 per channel). The change in these capacitors results in higher resolution, extension, less grain and more air. The 2uF output coupling capacitors (4 per channel) are replaced with 4uF Dynamicaps. This change provides more drive, bass extension, resolution and dynamics while also reducing grain. 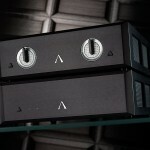 For the phono section, the Signature Version uses custom-made inter-stage Teflon hybrid coupling capacitors, replacing the polypropylene units, between the 2nd and 3rd gain stages(2 total per channel). The change in these capacitors results in higher resolution, extension, less grain and more air. The 2uF output coupling capacitors that drive the line section (2 per channel) are replaced with 4uF Dynamicaps. This change provides more drive, bass extension, resolution and dynamics while also reducing grain. Highly specialized adjustable air-core capacitors, used primarily in the radio-frequency realm, are installed and adjusted to “tweek” each unit to a rigid standard. The five rubber feet are replaced with Harmonic Resolutions Systems’ Nimbus Couplers specially made for Aesthetix (Earlier Signature Saturn pieces did not incorporate this, please contact Aesthetix for this free upgrade if you have an earlier Signature piece without the Nimbus Couplers). This change results in a lower noise floor and more air and space. The cost of these specialized parts alone is about 1/4 the manufacturing cost of a brand new unit! Any tubes that can be bettered by our special stock of graded and matched tubes are replaced. Any other improvements needed to make the unit current are installed, including software updates, etc. A new lens with “SIGNATURE” stenciled is installed. Each Signature unit undergoes rigorous test procedures and listening. 搶先評論 “Janus前置唱头放大器 / 签名版前置唱头放大器” Click here to cancel reply.